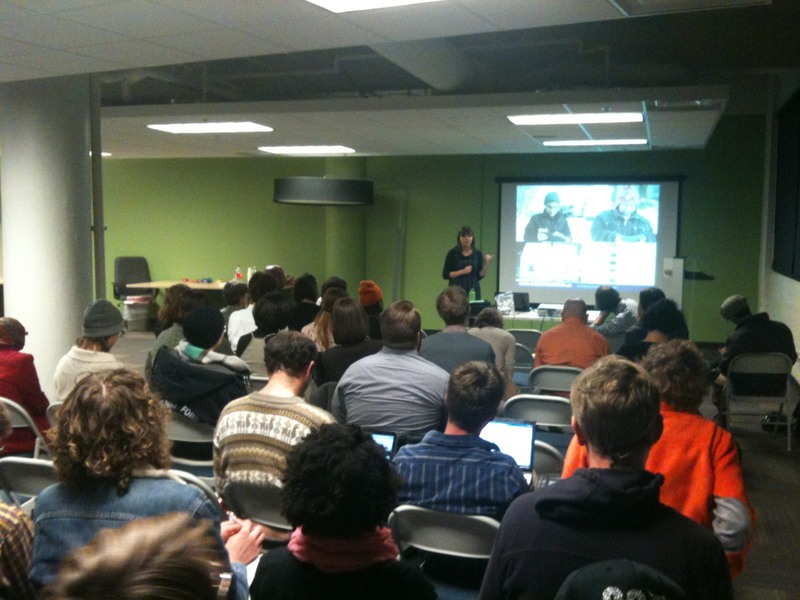 The inaugural #MaptimeDETROIT event went very well with lots of great presenters and about 40-50 people in attendance. I kicked off the event with a quick background on what #Maptime is all about as well as the radical cartography of William Bunge and the Detroit Geographic Expedition & Institute (DGEI) focusing their community mapping efforts on the racial imbalance of development in Detroit. I think it is too presumptuous to say that the different presenters offered “best” practices in community mapping since there were many people who were not in the room and not represented, specifically from many community organizations that have been doing community mapping work for many years. Aaron Goodman talked about how CDAD has recently launched the Detroit Community Organization Mapping initiative to map all of Detroit’s community groups as well as their service areas. Data Driven Detroit is supporting their application to collect information from groups. Madhavi Reddy presented on the CDAD’s “Strategic Community Planning” process where they are invited by community groups to do create a plan for their own community. A critical piece of this process is allowing communities to self define their own “engagement zones.” CDAD hopes that they can work with the City of Detroit in putting together a neighborhood focused master plan since the city is currently operating without one. Justin talked about the current water shutoff issue in Detroit and their efforts to map community water stations. The DWB spends a lot of time going door-to-door talking with residents about the water shutoffs and other basic needs. Jerry gave a nice overview of the Motor City Mapping project as well as the recent additions of Highland Park and Hamtramck (two small cities that are surrounded by Detroit). Jerry talked about meeting with Herb Harris who was the sole bidder on the “blight bundle.” He discussed the water shutoffs in terms of renters vs. owners and believes that many people facing shutoffs are renting and at the mercy of their delinquent landlords. In the same vein, he talked about the depressing nature of the Wayne County Property Auction where Loveland has found a vast majority of foreclosed homes are actually occupied dwellings. Diana’s presentation was also focused on the Motor City Mapping project that was completed with Loveland Technologies. However, she was more focused on the implementation process of surveying every land parcel in the city. D3 and Loveland worked with roughly 400 community residents to map the entire city. They are currently working on improving community trainings as well as thinking about best ways to implement mapping tools with community support. Nina and Libby presented specifically about the process of participatory design. They utilizing an ever changing process that builds on itself in their design and mapping work. The Work Dept. is very focused on building tools and processes that others can implement in their communities. They’ve recently worked with Allied Media Projects (AMP) on their internet mesh network toolkit, which has been implemented in Detroit, Kenya, and India. 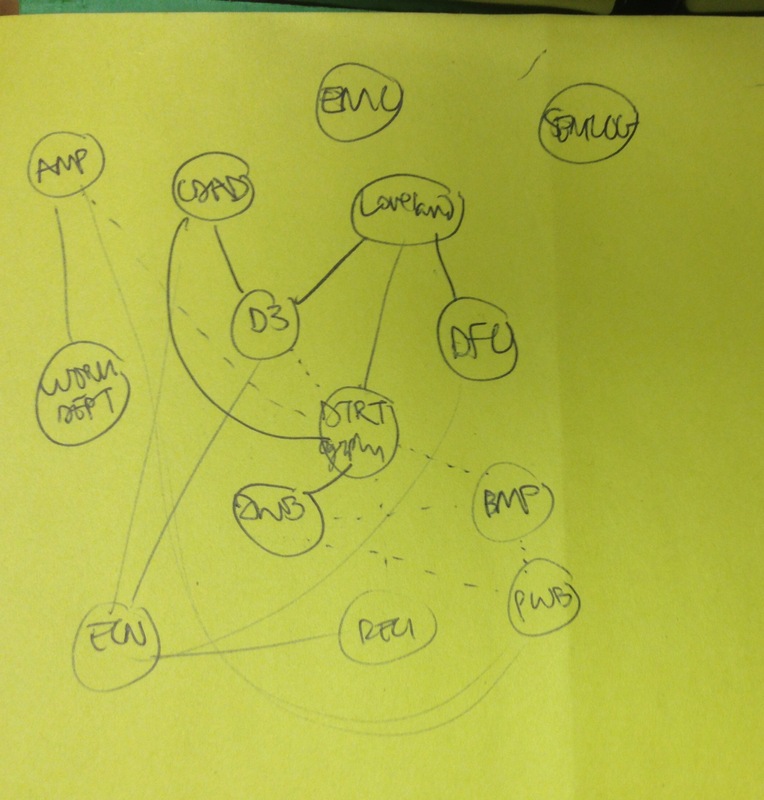 When Fiona started working on food access issues with EMC, there was no one else working to map out locations of farmers markets and other access points. EMC runs the Eastern Market Farm Stand program and works with others such as Fresh Food Share through Gleaners. Now EMC offers a community map every year with different food access locations. Erin presented on a very specific project focused on the ecology of Detroit land. She is working with the LEAP group on surveying vegetation and making community decisions on what should be done with vacant land. She also spoke to how these plans all fit within the DFC strategic framework plan.